I have seen many women who struggle when they find themselves in the man’s world. One of such is in the area of transportation. With the quality and specification of bike that a woman needs, it’s hard to find one that conveniently suits. This all ends with Northwoods bikes. The Northwoods ladies Springdale 21 Speed Hybrid Bicycle, 700c review gives a detailed insight of what might seem to be the answers to all lady wants in a bike. It looks a bit like the retro but smoother, plus, it is very comfortable for commuting and recreational purposes. This is not meant for long trips or very serious cycling. Users with these in their mind should look for alternatives. Having decided to get a bike, you should know that the Northwoods ladies Springdale 21 speed hybrid bicycle is a good choice if you are a lady. It is also perfect for bikers who love conventional biking and who wish to experience a little more than the conventional cycling in rugged terrains. Don’t just go yet, if that’s not what you want or you simply want a leisure bike, then you can still get this Northwoods hybrid bike. This bike is specifically designed for ladies of average height who need good biking experience and skills on the road and off. It also offers quality with its price range. 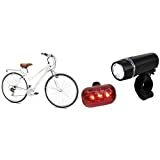 So if you are on a light budget, you should get this bike. For those who are into or want to go into mountain biking, I wouldn’t advise you to get this bike. You can get a good mountain bike from trusted online stores or bike shops around you. Mountain bikes are built to be durable enough to stand tougher and more difficult terrains, and that’s why their aluminum frames are very strong and sturdy. This Northwoods women’s hybrid bike claims to guarantee an enjoyable cruise for recreation and in commuting. Aside from the fact that it is affordable, you are assured of comfort and quality. It is very attractive which is why you can happily show it off to your friends and coworkers without reservations. It is durable and reasonably tough as it comes with a handcrafted aluminum lightweight frame. Its basic components include its high valued 700c alloy rims, the Shimano parts, and a rear rack. It is the first and only edition of this model. You should also note that the bike comes in a large box with seat, pedals, handlebars, front tire, and rear rack that not attached. This bike will help you if you are a commuter, or you need a bike for leisure or you need a bike to burn some calories. It is enjoyable and as a result, you might not even know when you lose all the weight you have been trying to get rid of in all these years. This recreational bike is very comfortable ensuring you have an upright and stable riding position. This is why it can be used for recreation and around town commuting. I would probably get this for my little girl. Together we will always have a long ride every day. This is possible because the aluminum frame is super lightweight and for the price, it offers great comfort. Another nice thing about the frame is that it is suitable for adults. Most bikes of this same market range have smaller frames say around 17 inches. This can be too small for most average to tall adults. You might not get this frame quality at this price from another model. Although the quick-release wheels are missing from the Northwoods Springdale women’s 21-speed hybrid bicycle, I can say that the advanced brake system complements this missing feature. It doesn’t just ensure a smooth and safe ride but also delivers all round good response experience. 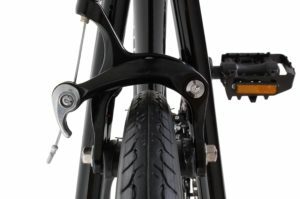 The linear pull brakes also offer confident stopping power. So you simply have an enjoyable biking experience with your Springdale. If you want a bike of a premium grade, dependable materials, and up to 21 speeds, then the Northwoods Springdale bike is just perfect for you. This bike is built for multiple terrains and a variety of all other demanding activities. The Shimano Tourney rear derailleur and the 21 speed makes it easy to shift between gears when necessary in different terrains. It also offers easy adjustability for up and down hills. For storage and delivery purposes, this commuter bike comes with a rear rack. This rack is firmly fitted, great and is situated at the rear end of the bike. You can carry your purse with you by placing it on the rack without worrying about it falling off. Additional features include alloy rims and fenders. This recreational bike frame also comes with upright handlebars for an easy and a comfortable riding. Question: What is the maximum weight for this bike? Question: what do I need to assemble this bike when I get them? Question: Does it come with the quick release wheels? Answer: it doesn’t, but the advanced brake system can cover for this. Unlike the Northwoods ladies Springdale, the Giordano G7 is designed with the 21 speed Shimano Shifter and Derailleurs for shifting between gears. The major difference is that it weighs 39.2 pounds and is of height 17”. It perfectly suits a women commuter biker. It cost much of as the Springdale commuter bike. If you want a bike a bit smaller than the Springdale to suit your height, then you can get this bike. Depending on the speed you get, the seven-speed high-level Shimano internal gear system delivers quite a high-intensity riding making it capable of further distances. It is heavier than the Springdale but in the same price range. Just as the Springdale Hybrid bike, the Schwinn Capitol women’s bike offers comfort, efficiency, and durability when riding. They both have alloy wheels and a durable aluminum frame. There is a difference in the gearing system. One major difference is that the Capitol has enough bearing for the easy riding position. It is also heavier than the Northwoods Springdale bike. It’s just a few bucks more expensive. I believe that the Northwoods Springdale bike review of 700c was detailed enough for you to know all you need to know in case of a probable purchase.